THIS year’s coveted Bill Silk Award was presented to the much-deserving deserved Peter Coxhead for his many years of help in making Chobham a better place. A structural engineer, Peter was co-founder of Chobham Business Club when he opened his office in the village in 1983. He was very involved with the club and took over as President after fulfilling the role of Secretary before retiring a couple of years ago. ure of, and as a consultant for, Chobham Museum. As an honourary member of the business club, Peter and his wife Maureen were special guests at the annual Christmas dinner. 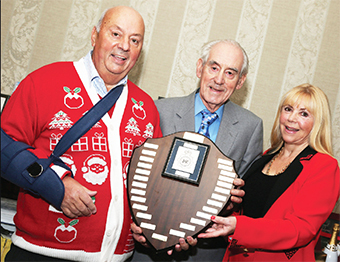 The club paid for a taxi to Foxhills for Peter, who is in his 80s, and there he was presented with the Bilk Silk shield by current President Gordon Parris MBE, and Chairman Tricia Matthews. The trophy was given to the club by local bobby Bill Silk in 1985, before Chobham’s police house was closed.